29 Agustus – 5 September 2015. Pukul 09.00-16.00. Oculus Sribaduga. Bayu Widagdo, M.Ds – FSRD ITB. Storytelling Lip Motion. Viananda Andrias M.Ds – FSRD ITB. Bandung Smart Transportation System. STEI ITB. Lumen Robot Friend. STEI ITB. Sabtu, 29 Agustus 2015. 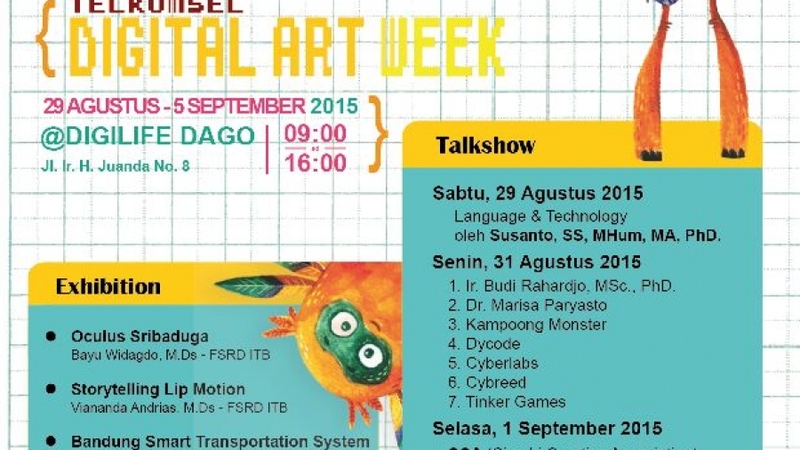 Language & Technology oleh Susanto, SS, M.Hum, MA, Ph.D.
Senin, 31 Agustus 2015. Ir. Budi Rahardjo, M.Sc., Ph.D. Dr. Marisa Paryasto. Kampoong Monster. Dycode. Cyberlabs. Cybreed. Tinker Games. Selasa, 1 September 2015. CCA (Cimahi Creative Association). Kamis-Jumat, 3-4 September 2015. Workshop Mobile Game Developer oleh Indismart. Sabtu, 5 September 2015. Workshop Fun Blogging oleh Sinta Ries. More info contact: Wuri Cahya – 081233158589.